For many, the resulting July 2004 advisory ruling against Israel has become a cornerstone when it comes to the question of international law and its role in resolving conflicts around the world. For Heideman it was a situation in which Israel faced one of its toughest challenges to date — and one which might have shaped the future challenges facing the state. That case, he says, had a drastic influence on the threats sounded by the Palestinian Authority as it negotiates with Israel. In a July 2004 advisory opinion issued by the ICJ, it called upon Israel to remove the barrier and compensate those damaged by its initial construction. It also listed other Israeli actions it viewed as illegal, which had little to do with the barrier itself. Heideman says the court didn’t look at the context in which the fence was built. “The fact that it was constructed after years of fighting,” or that “it was built because hundreds of Israelis were killed and thousands hurt in terror bombings” wasn’t addressed by the court. Heideman makes sure to call the barrier (which has many terms, depending upon one’s political stance,) the “terrorism-prevention fence” throughout the entire interview, using the terminology laid out by Israel’s Foreign Ministry during the ICJ debate. 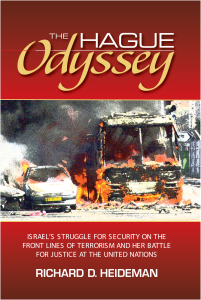 In his latest book, “The Hague Odyssey,” Heideman shares his experiences from the ICJ case against Israel. However, he says, the starting point of the story is as old — if not older — than the state of Israel. “The fighting against Israel started before there was an Israel,” but at one point “it shifted from a military offensive to a verbal one. “President George W. Bush had made his Rose Garden address, in which he laid out the ‘road-map’ for the Israelis and Palestinians to follow… It was accepted by all sides involved, and, as a result, the quartet was formed,” he said, explaining his position. While the UN Security Council, the US, EU, Russia, Israel and the Palestinian Authority had decided to work according to the Bush plan, the UN General Assembly — “using the ‘One country — one vote’ system” — chose to refer the issue of the fence to the ICJ. Currently the honorary chairperson of SCIL, an annual student conference on international law organized by StandWithUs, Heideman spoke to The Times of Israel shortly after spending time with the next generation of attorneys and international law experts. “The world of international law is moving toward international jurisdiction,” was his response when asked about the future of his field. International jurisdiction is “a situation in which any person could be prosecuted and tried in any country — something that could be very useful at times, but an idea that is threatening Israel at the moment,” the attorney argues. On the one hand, such a change “would allow an aggrieved Syrian to demand justice” he won’t get in a court at home, but it also means “politicians and companies involved in building the terrorism-prevention fence” have had subpoenas issued against them in various countries. Heideman says that one outcome of the move toward international jurisdiction and the 2004 ICJ ruling is that the Palestinians are currently “threatening Israel with two weapons,” even as they hold talks under the auspices of US Secretary of State John Kerry.